Have I ever mentioned that breakfast is my favorite meal of the day? Seriously, there is just something about getting up in the morning to an ooey, gooey, cheesy dish filled with eggs that sets the mood for an absolutely awesome day! While admittedly, school days require simplicity when it comes to morning meals, in my home there is never a bad time for the perfect breakfast dish! That’s why no matter how short we are on time in the morning, heading to the kitchen and whipping up something awesome is just how I do things. 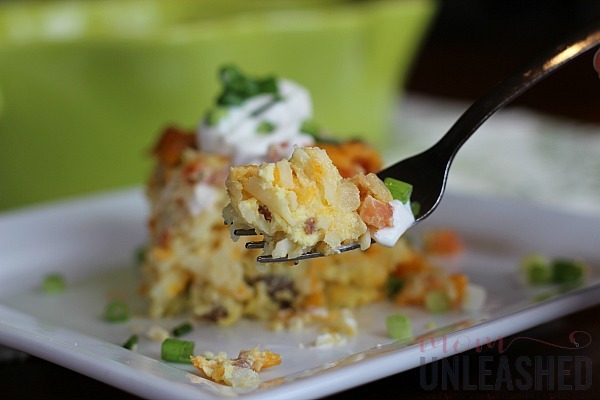 I’ve got a variety of morning menus that my guys love but I have to say, right now we’re all crazy over my Southwest Cheesy Hashbrown Casserole! This absolutely drool-worthy combination of hashbrowns, sausage, eggs, cheese and southwestern veggies is literally the perfect way to start any day! In fact, I just recently made a double batch so that we could enjoy it as a weekend dish and then savor the flavors all week long (hint, hint!). 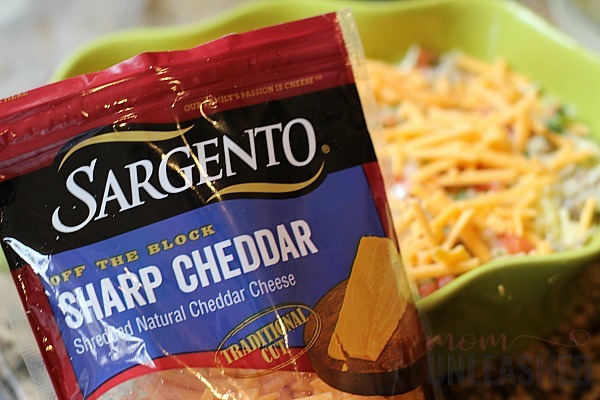 While this dish is crazy easy to whip up, it does require a few key ingredients, like Sargento® Shredded Sharp Cheddar Cheese in traditional cut. This brand is my cheese of choice because it’s always shredded fresh off blocks of real, natural cheese. For me, that Sargento® quality translates to amazing breakfast dishes! When paired with eggs and a few simple ingredients, Sargento® is the perfect way to get a great tasting breakfast each and every time! Even better, from now until April 10th Harris Teeter is making it so easy to create your family’s favorite meal of the day by offering a coupon for one (1) free carton of one-dozen grade-A large eggs when you purchase two (2) Sargento® cheese shreds at one of their stores! This delicious deal is literally the perfect starting point to whip up my Southwest Cheesy Hashbrown Casserole! Now that you’ve got a great money-saving offer to get you started, let me show you how to make what will undeniably be your family’s new favorite breakfast dish! 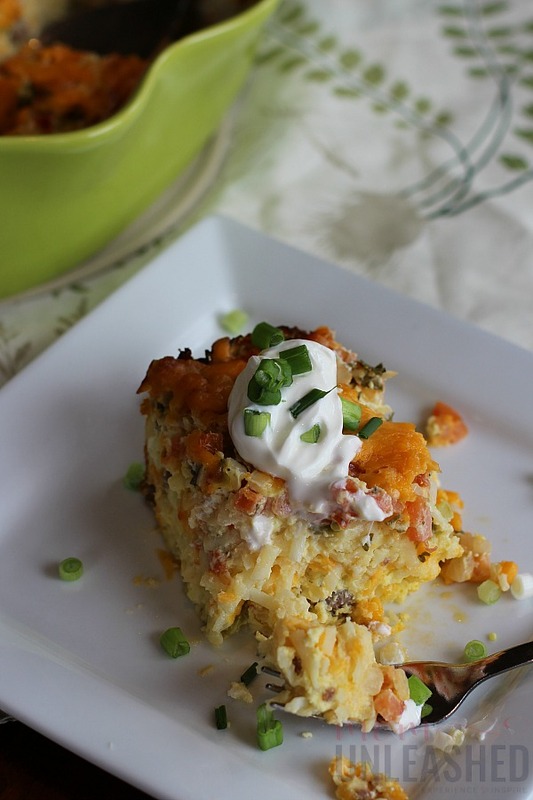 This Southwest Cheesy Hashbrown Casserole is without a doubt THE favorite breakfast dish in my home and it’s so easy to make! In fact, I whip it up in batches and make individual containers that are easy to heat up each morning for the kids’ breakfast. It’s not rare at all for me to make a double batch of this recipe….one for now and one for later! Here’s how I do it! To start, I crumble my breakfast sausage into a saute pan and cook it until it is done (about five to seven minutes). 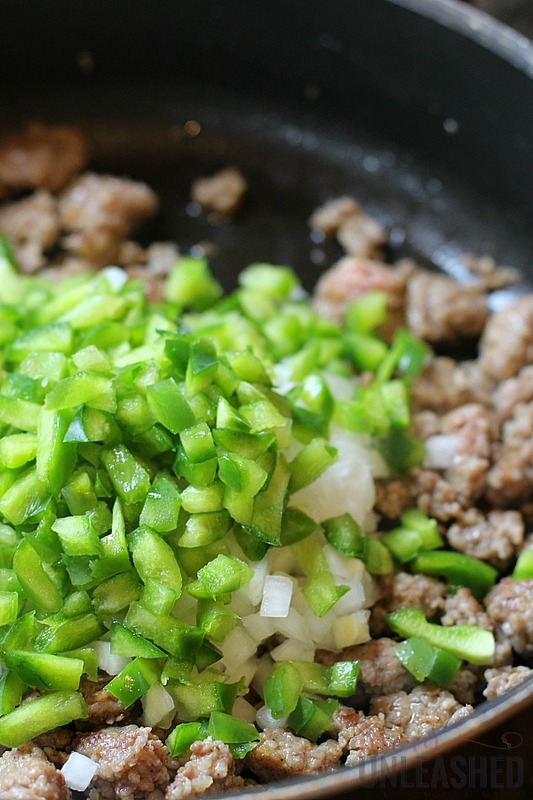 After draining the grease off, I add my sweet onions and green peppers and return my pan to the heat, cooking all of my ingredients together for about three minutes, just until my onions and peppers have began to soften. After sauteing my breakfast sausage, sweet onions and peppers together, I remove my pan from the heat and add my frozen hashbrowns to a bowl along with my sausage mixture. 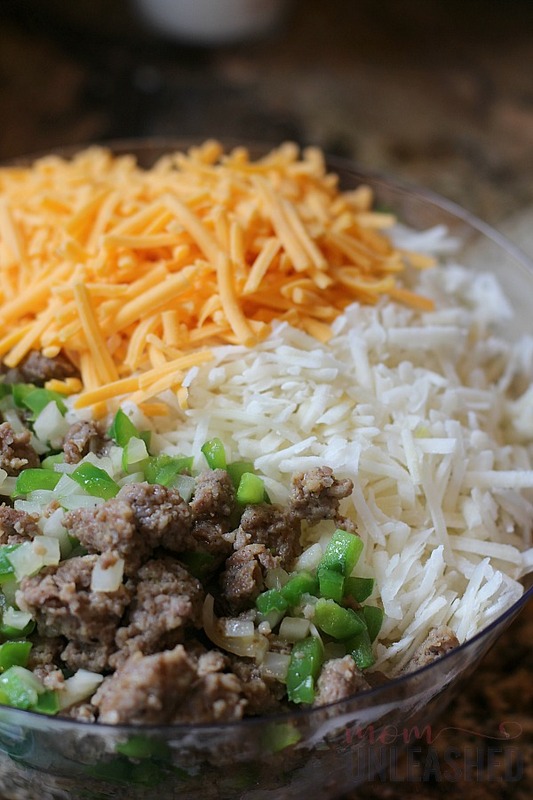 Next, I add two cups of my Sargento® Shredded Sharp Cheddar Cheese and mix all the ingredients together. After preheating my oven to 350 degrees, I add my hashbrown mixture to a greased baking dish, pressing it down gently to ensure that all the deliciousness fits in (the casserole dish should be filled no more than 2/3 of the way full with the hashbrown mixture). 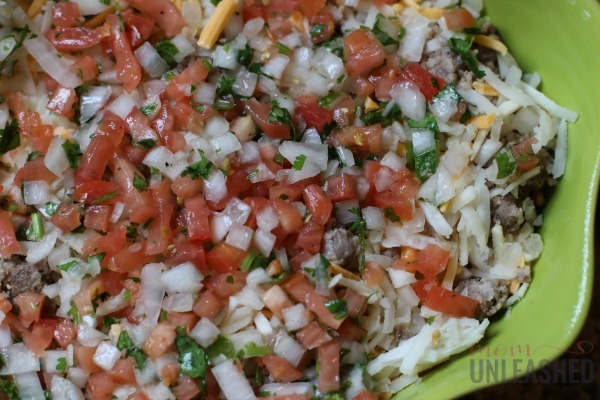 Now, my family likes a little spice in our food so after adding my hashbrowns to my baking dish, I like to add a layer of pico de gallo. 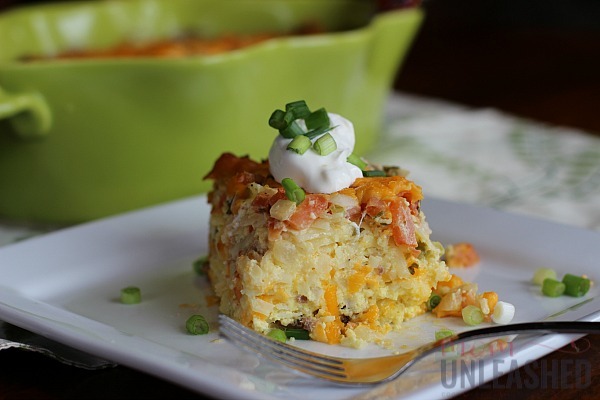 It just adds a depth of flavor that really makes this Southwest Cheesy Hashbrown Casserole taste amazing! 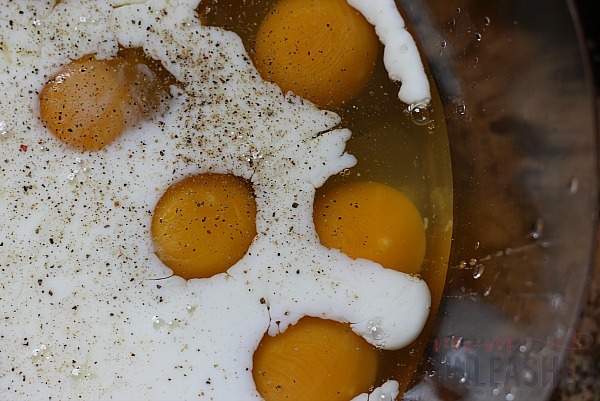 Once I’ve layered in my pico de gallo, I crack my eggs and add them along with my milk and pepper to my mixing bowl. Then I use a whisk to mix it all together. Once my eggs and milk are mixed, I simply pour the mixture over my hashbrowns, ensuring that I do not over fill my dish. 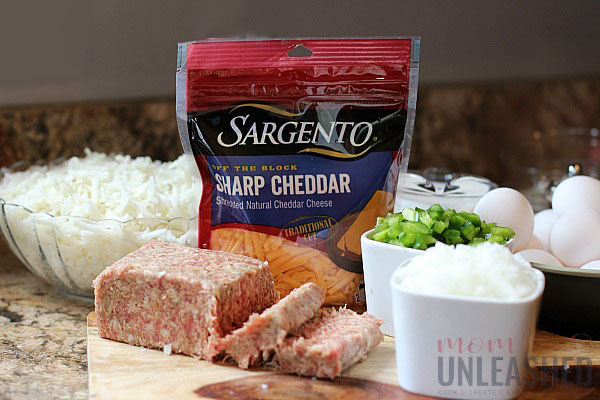 Once my egg mixture is added to my dish, it’s time for more Sargento® Shredded Sharp Cheddar Cheese because I did say this recipe is CHEESY! For my finishing touch, I sprinkle my remaining cup of Sargento® Shredded Sharp Cheddar Cheese over the top of my Southwest Cheesy Hashbrown Casserole and pop it into the oven at 350 degrees for one hour. After an hour, my Southwest Cheesy Hashbrown Casserole is golden brown around the edges and firm in the middle, making it just right to serve up to my family! Seriously, I’ll get out of bed any morning of the week for a dish that looks like this and has the cheesy goodness of Sargento® Shredded Sharp Cheddar Cheese in each and every bite! After dishing out servings of my Southwest Cheesy Hashbrown Casserole, I like to top things off with a dollop of sour cream and some freshly chopped green onions for a flavorful breakfast that always satisfies! Then all that’s left to do is savor each bite of this amazing breakfast dish that everyone in my family adores! 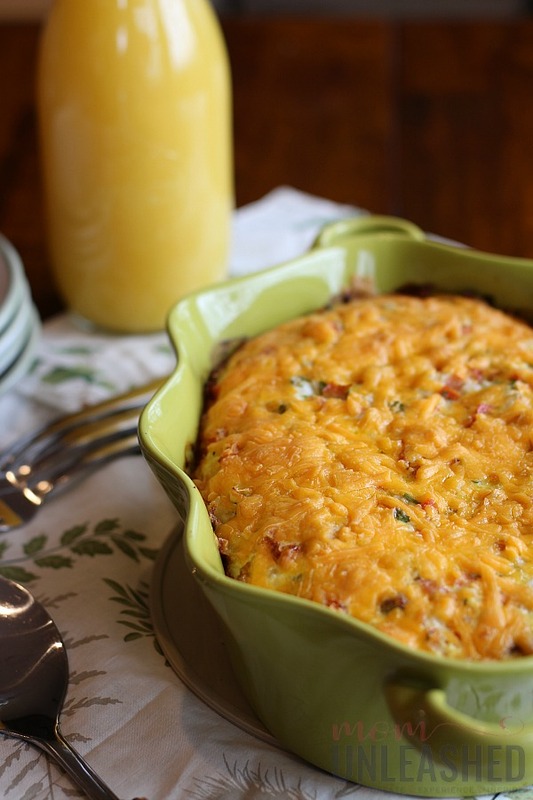 I will be honest and say that for my family, I can never go wrong with Sargento® Shredded Sharp Cheddar Cheese and eggs but by adding in a few addition ingredients to create this Southwest Cheesy Hashbrown Casserole, I’m able to create a breakfast that is savory and always satisfying! Now it’s your turn! 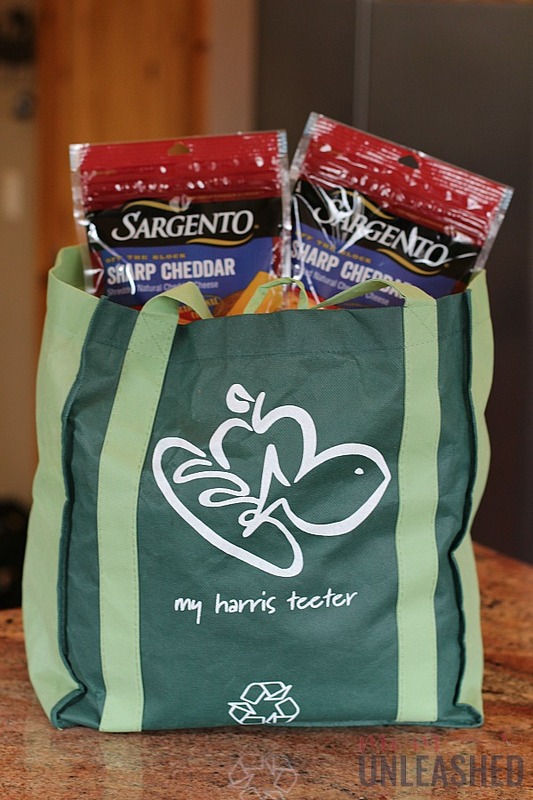 Head to Harris Teeter today to pick up your Sargento® Shredded Sharp Cheddar Cheese or any other of the Sargento® fresh off the block cheeses! Be sure to grab your coupon for one (1) free carton of one-dozen grade-A large eggs when you purchase two (2) Sargento® shreds at Harris Teeter here! Good from now until April 10th, this great coupon will help you get the items you need to start any day off right! 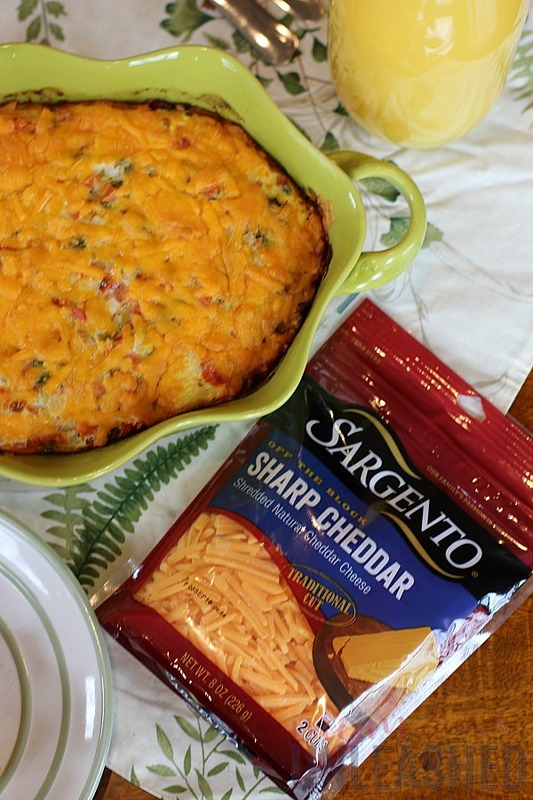 Whether you whip up my Southwest Cheesy Hashbrown Casserole or create your own amazing breakfast recipe, remember that any day that starts with Sargento® cheese is sure to be delicious! Now tell me, what’s your favorite breakfast recipe that features the great taste of Sargento® cheese? My kids are going to LOVE this. 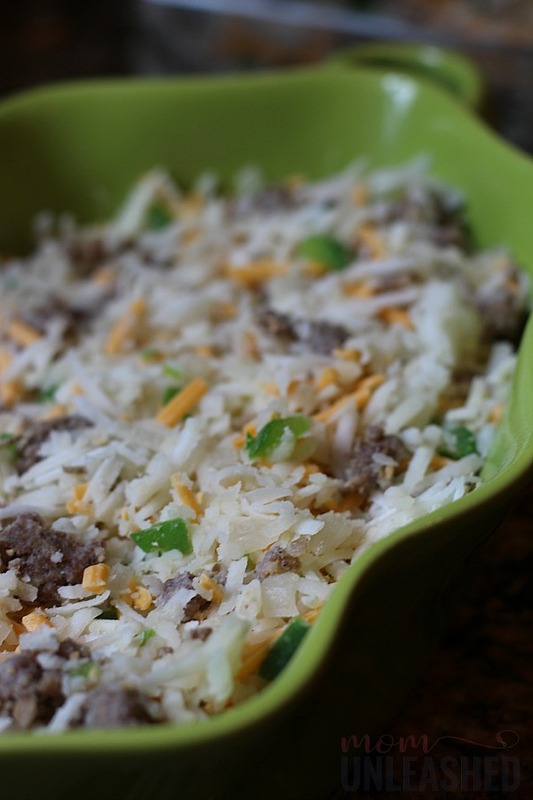 We are big on casseroles around here as it is, but this one sounds like a real winner. This is my kind of casserole. I tend to love anything with cheese on it. I might surprise my family by making this for breakfast one morning. They’ll be shocked that their only option isn’t cereal. My family loves dishes like this. I love it because it is easy to make, feeds a bunch and can be made ahead and frozen if I want. A hashbrown casserole?! I can stare at this for hours (and grab drool while I’m at it). 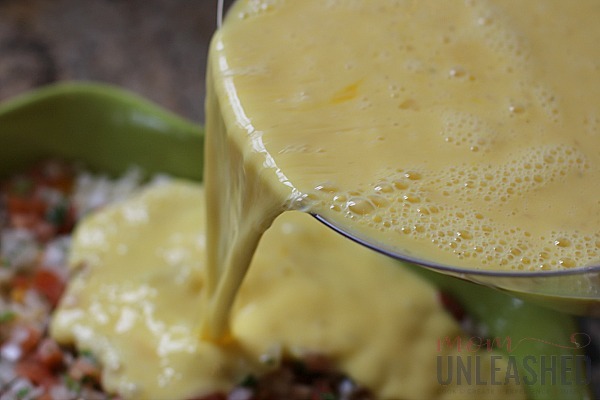 Totally love the fact that you put sharp cheddar in this recipe… for me, the stronger the cheese, the better! Kelly Reci recently posted..Marvel Studios’ CAPTAIN MARVEL Coming March 8, 2019! That looks so much better than the one I get at Cracker Barrell. I have never tried to make one but after seeing yours, I’d love to try it. This sounds like the absolute PERFECT addition to Easter brunch. I can’t get enough of cheesy potatoes and neither can my family. Can’t wait to make it! Oh my goodness! This looks SO delicious. I can’t wait to give it a try! I am pretty sure my whole family would LOVE this! Thanks for sharing the coupon. This would be perfect to make for breakfast this weekend! That sounds like my kind of breakfast! I’ve not had a hashbrown casserole in ages and I don’t think my kids have ever had it. I need to make this for them! This casserole looks absolutely delicious. I am loving the flavors. I need to make this for brunch soon. I make a casserole very similar to this one. My family loves it, but yours sounds even better. Going to give it a try. 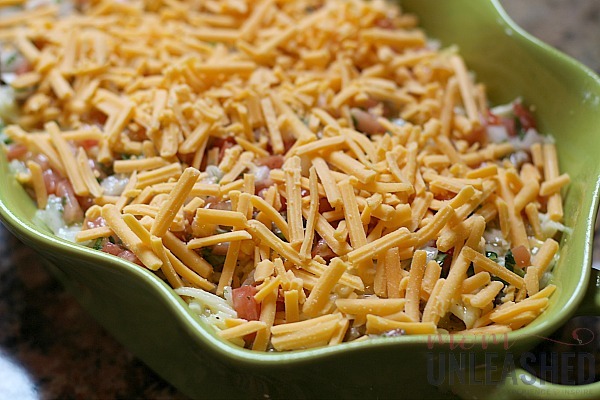 I love casseroles like this, filling and so good! I think it’s perfect for brunch especially if you have family or friends over. The recipe is quick and easy! That looks so good! I’ve been making quiche lately, so just for something different, I might switch to this. I definitely love waking up to something warm and nutritious in the morning. This looks absolutely amazing! I need to give this a try real soon. I think my family and I are really going to love this. You had my attention with the southwestern. I love how this sounds and looks. I can just taste it . Breakfast is my favorite meal of the day too! And when I start out my day with an amazing meal like this one, I know the rest of the day will be great. Layer on the cheese! It’s my fav! You had me at hash browns…LOL!! I make a hash brown casserole but it’s different than this. I need to try yours!! 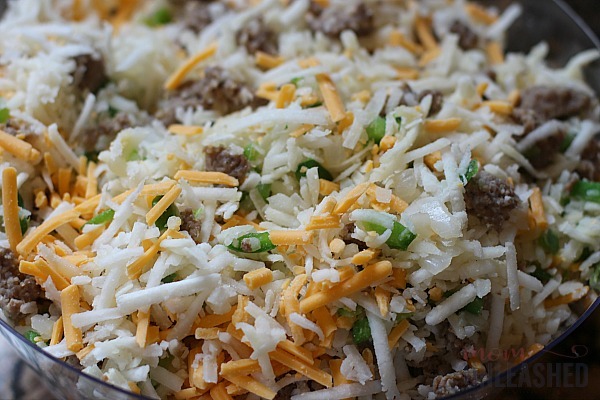 This casserole looks super delicious! I am definitely going to try this one at home ! This sounds good. We love hash browns in our breakfast, but with only vegan ingredients. Will give this a vegan twist. Yum! this is my kind of breakfast dish, nice and hearty. I’ll be making this next weekend. I rarely have hashbrowns for breakfast, but when I do it is always a treat. 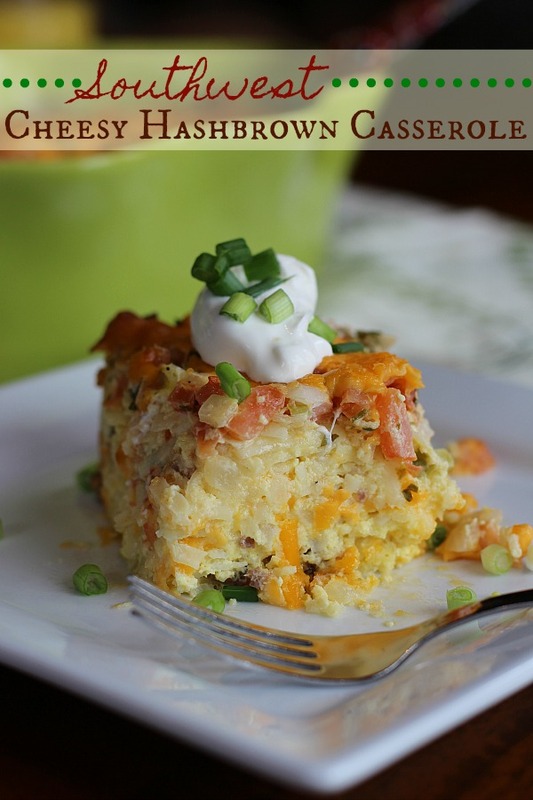 I like the idea of a hashbrown casserole, need to try that. Natalie recently posted..Spring Makeup Look with Yves Rocher + Giveaway! I’ve tried a similar recipe but without the veggies. This sounds so good. I’ll have to try your recipe the next time I make it. Your food photography is superb!! Plus you made it sound very easy. Thanks for this post!